Heavyweight Padding – In strategic areas to eliminate shearing forces caused by running back and forth on court. 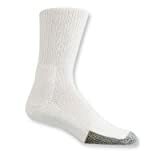 Thorlo crew heavy weight padded unisex tennis sock. The original! Heavy weight padding underfoot minimises shear forces of abrupt stop / turn nature of tennis. Play longer with fewer blisters. Acrylic fibre wicks moisture to keep feet cool and increase durability. This entry was posted in Tennis and tagged Crew, Heavy, Padded, Sock, Tennis, Thorlo, Unisex, Weight by FPSports. Bookmark the permalink.